New Auxiliary Fuel Tank Kit with Fuel Tank Skid Plate. 1977 Ford Broncos ONLY! 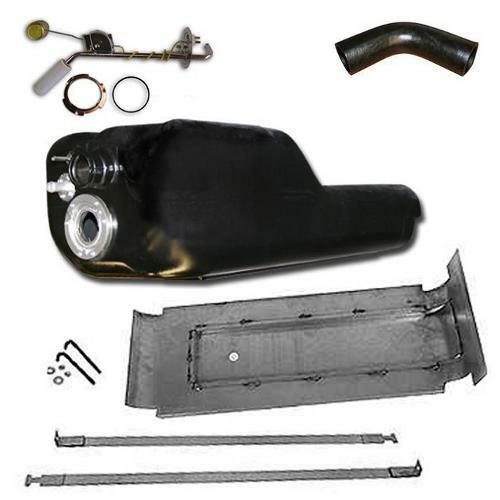 THIS FUEL TANK KIT INCLUDES: Front Auxiliary Fuel Tank, Fuel Tank Skid Plate, Fuel Tank Sending Unit, Gas Filler Hose & Gas Tank Vent Hoses & Fuel Tank Mounting Strap Kit. Another Tom's Bronco Parts Exclusive!!! This new poly fuel tank is an exact replica of the original Early Bronco front auxiliary fuel tank. Includes fuel sending unit o-ring and lock ring. Unlike the aftermarket poly fuel tanks, our new OE-Quality Auxiliary Gas Tank is exactly like the original fuel tank in that it uses a lock-ring to secure the fuel sending unit, eliminating the worry of over or under tightening screws that can cause leakage in the tank.